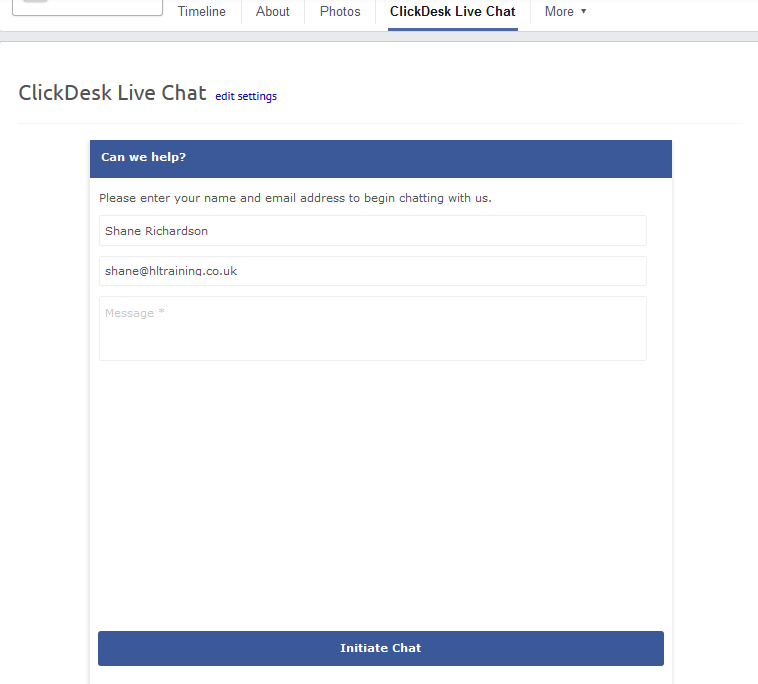 We have had huge success using ClickDesk on our website, we have now implemented it onto our Facebook page. This will allow all of our customers accross our website and Facebook to now chat directly to our sales team. If you have any queries regarding training, whether for a company or for yourself, we have contractors with experience in most machinery and can offer our service at our training centres (Bristol and Clevedon) or on customers sites. If you are not 100% sure what kind of training you require, or have specific questions that cannot be answered by browsing our website, please contact us ClickDesk and we will get back to you as soon as possible. See image below on how to contact us via ClickDesk on Facebook. 3. Once complete, press “Initiate Chat” and your message will be sent through to the Agent dealing with enquiries on that day. The company is registered in England. Constructive, informative and professionally delivered training. Felt comfortable and at ease throughout. The instructor was polite and patient and although it was a just a refresher course it helped me remember certain things i may of forgotten. All in all a good day training and i enjoyed it. Staff were all excellent, very friendly and made me feel welcome. Vince helped everyone with the areas that they felt they struggled in, and the area's that he could see needed extra help. Nothing was too much trouble for all the staff. I personally and I know the other people with me would highly recommend them for forklift training. Excellent instructor with a well planned course layout. Highly recommended. A fantastic service from HL training both onsite and there aftercare service. Nothing is too much trouble and they make you feel relaxed from start to finish. Looking forward to working with you again. Site facilities are good, trainers are knowledgeable and helpful. Overall the raining days were a good experience and useful knowledge learned. The training was very good with a lot of positivaty in the training room and on the practical assesment. Vince was an extremely good trainer. The course was very informative and helped a lot in my role at work the instructors were very knowledgeable and the course was tailored to suit our needs would recommend to friends and colleagues. Vince was my instructor on a 2 day Gantry crane course recently, he was very helpful, knowledgeable and easy going. I highly recommend this company.